Collectibility Rating: Roundneck: C, Squareneck: D- (a brass body makes for a lower rating, also this model is fairly common). 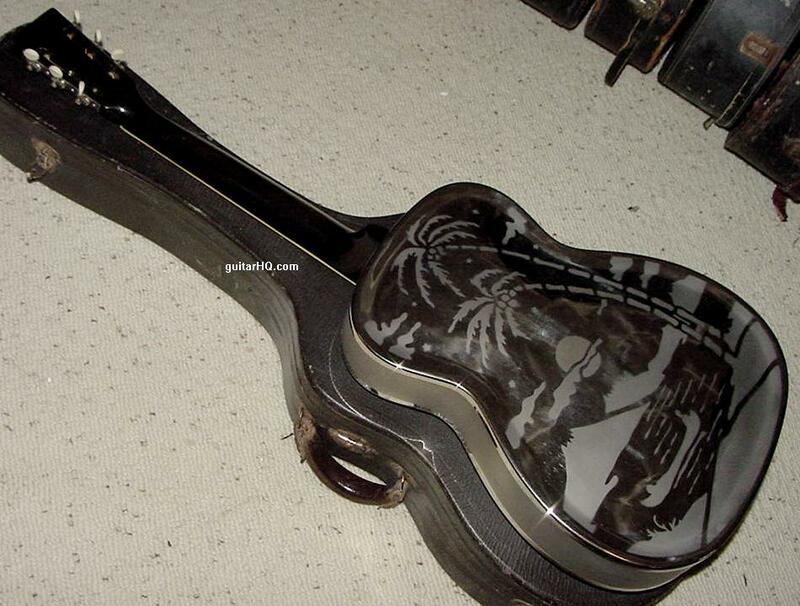 General Comments: Single cone resonator, nickel plated body with sand blasted Hawaiian scene on back and palm trees on front and solid area on sides, round shoulder, upper F-holes, round neck, dot inlay fingerboard, bound ebony fingerboard. There were 6 different variations in the sand blasted Hawaiian scene, and 8 total Style O variations if you include body changes. 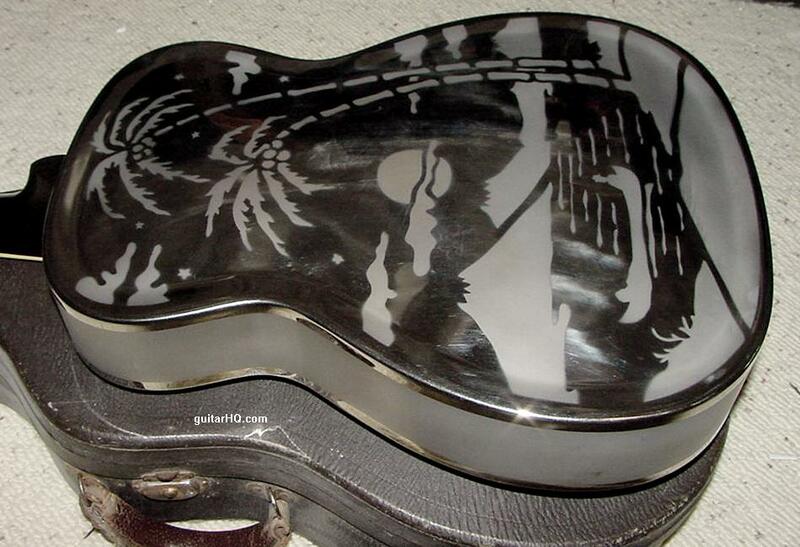 Four of the six sand blasting variations were used on the 12 fret models. 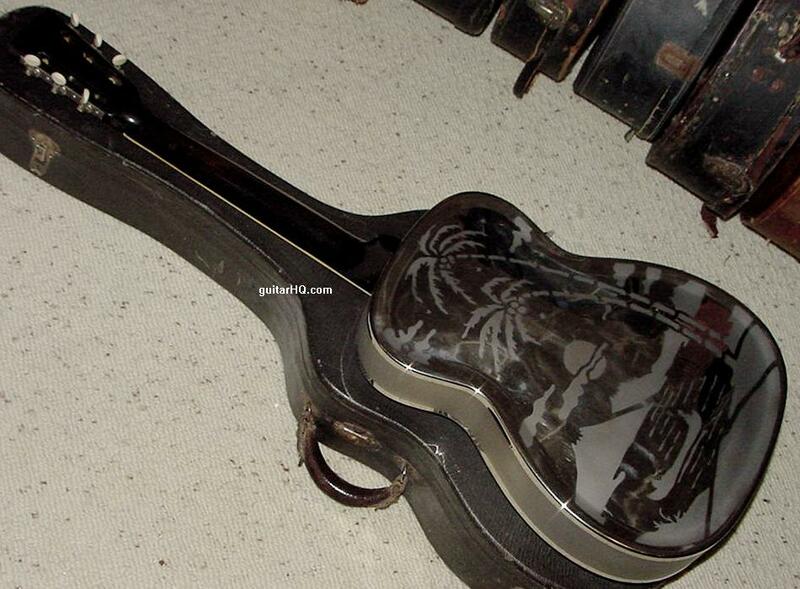 If you need to figure out the exact year of your National Style 0 guitar, use the serial number. See the National Serial Number Info web page for help determining the exact year. 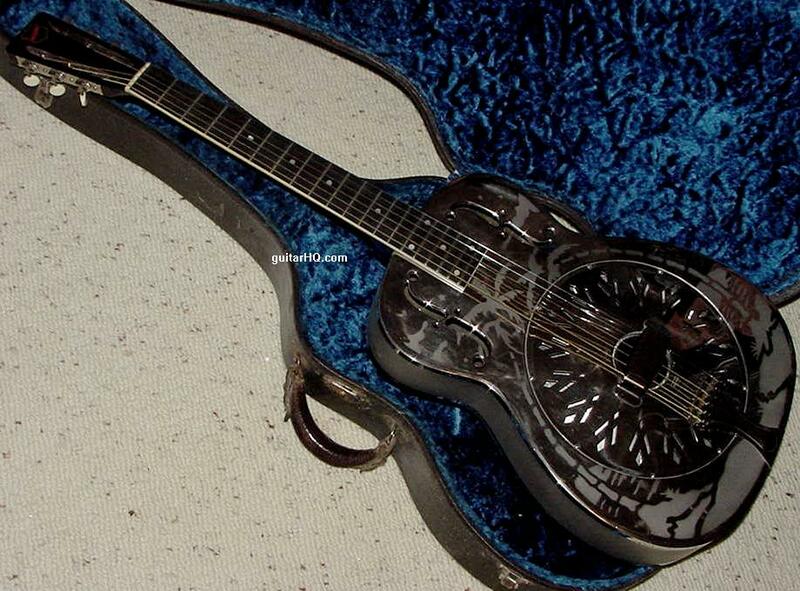 Steel body, nickel plated, Flat cut f-holes, 12 frets clear of the body, Slotted peghead, Maple round neck, Flat fingerboard radius, Resonator cover with small holes drilled in diamond patterns, "National" decal on peghead. Front scene: 2 palm trees, many cloud & stars, border. Brass body used instead of steel, nickel plated. Front scene: 2 palm trees with fuzzy centers, FEW clouds & stars, border. Front scene: 2 palm trees with fuzzy centers, few clouds & stars, NO border. 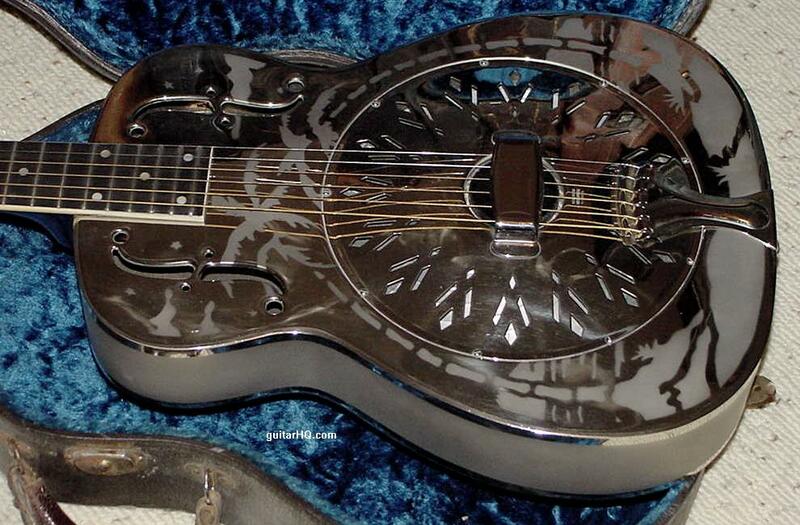 Brass resonator cover plate, nickel plated, Rolled edge f-holes, Resonator cover with four embossed radiating lines added, Square mahogany neck available. Front scene: 1 palm tree with CLEAR center, MORE clouds and stars. 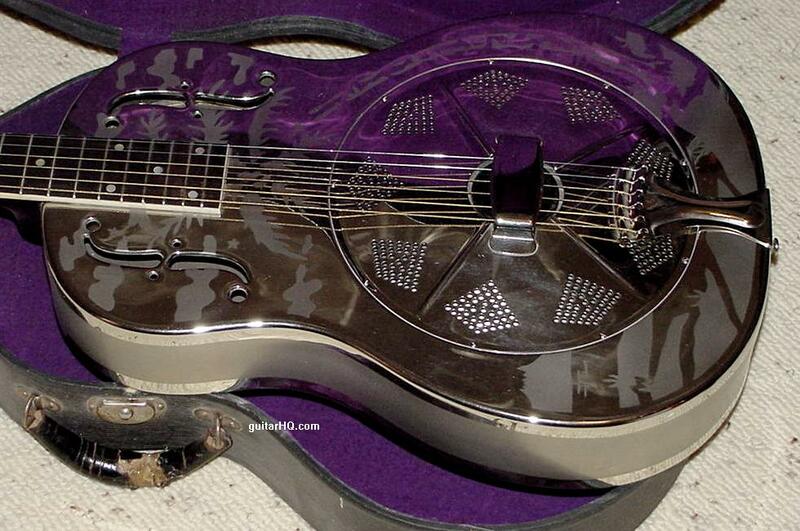 14 frets clear of the smaller body, 10 inch fingerboard radius, Diamond shape resonator cover cutouts shaped like "crow feet" (though the 1933 style cover plate is also used till 1936). Scene: simplier front & back Hawaiian scene. Solid peghead with arched "National" logo in celluloid letters, Some models with Mahogany necks. Scene: reversed 1934 scene and further simplified. 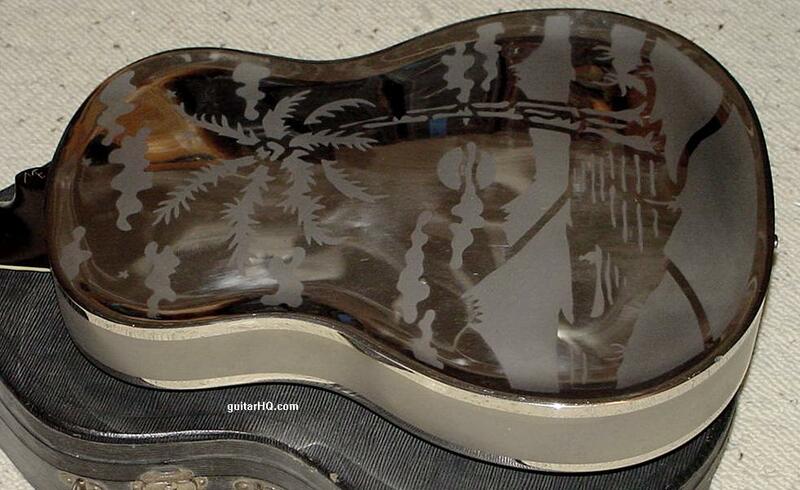 Clear or flowered white pickguard added, Palm trees etched on side of body. 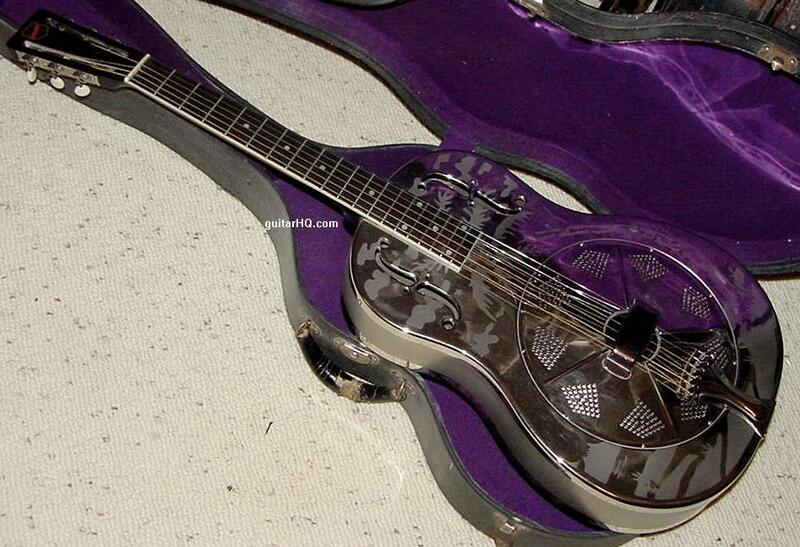 "National" etched into ebonized black peghead veneer, Slotted parallelogram fingerboard inlays. Enlarged "paddle" peghead, Metal National sheild logo.